The UMPC is first and foremost a computer. It runs a full version of Windows XP and Vista operating systems software. It might come equipped with full versions of popular Microsoft software applications such as Office, which includes Word, Excel, PowerPoint, and Outlook. With the full ability of running any Windows XP based software; it has the distinct advantage over the smaller Windows Mobile PDA devices, which requires software developers to construct software for the smaller screen sizes and simple windows mobile system. 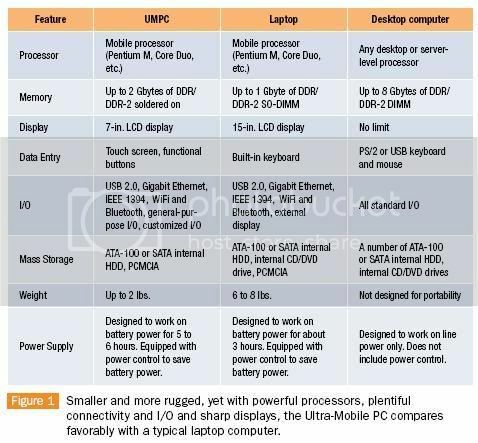 The UMPC is not a sit-on-your-desk computer, nor is it even a sit-on-your-lap computer; rather, it is a hold-in-your-hands computer. It is so small and lightweight that you can hold it in your hands, much like you would hold a book. It also sports a touch screen, making it super-easy to do tasks both simple and complex. Internet access is easy, of course. Running Internet Explorer or other Web browsers, you can access Wi-Fi hotspots, 3G data cards or even use a Bluetooth-enabled mobile phone to surf the Net. Email, downloading and uploading of audio and video files, instant messaging — it's all possible with the UMPC, which promises a fast connection wherever you go. Another helpful piece of functionality is GPS technology. Whether you use the Microsoft version or software from another provider, you can use the UMPC to give you directions from place to place, tracking your progress on the computer in your hand as you go. Such navigation can take place via satellite, 3G devices or Wi-Fi protocols. Like other portable computing devices, the UMPC can also be your "office on the go." You can sync up the UMPC with your home or work computer and take your documents, spreadsheets, audio and video files, email, calendar, and contacts with you while you're on the move. You can also take your games with you, offering a new way to enjoy video entertainment. 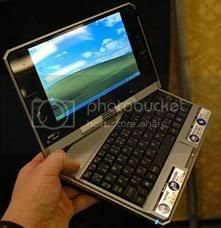 As far as technical specs, the UMPC has a 7-inch (about 18 cm) LCD screen with a minimum resolution of 800x480. Access is via the touch screen, which includes an onscreen keyboard. The aforementioned OS is Windows XP, which will enable you to run all your favourite applications and accessories and the whole thing weighs just two pounds, or just under a kilogram. UMPCs with Windows XP feature TFT colour screens that you can write, doodle, and draw on using a special stylus included with the UMPC. These tablets are touch sensitive, which means you can use the pen rather or your finger or any other handy object to write on or point at something on the screen. They work much the same way as Wacom digitizer (graphics) pads work, only you get to interact directly with the screen rather than using an intermediary accessory tablet. You can also use the stylus as a mouse, pointing at items on screen, clicking buttons, highlighting text and so on. If you've never gotten along with the trackpads and eraser sticks built into notebooks, you'll probably love the accompanying stylus provided with the UMPC. Another thing that makes tablets more attractive now is applications that support digital inking. Microsoft Office 2003 & 2007 and OneNote 2003 & 2007 all allow you to write when entering data. So you can write in Excel cells, handwrite and annotate documents in Word, circle and highlight items when giving PowerPoint presentations and more. Office 2003 & 2007 also supports dictation and reading documents out loud to you, which is perfect for tablets which come with built-in mics and speakers for voice command. OneNote is a wonderful app that uses a familiar tabbed file folder metaphor. It allows you to keep several folders full of handwritten notes for each project you're working on. It's a killer app for the XP OS machines. The Ultra-Mobile PC gives you the power of Windows XP wherever you go.